Kai and I still head out to our local nursing group twice a month, at the encouragement of our lactation consultant. She likes to have people who can model extended breastfeeding for new moms who are hanging out. Which means I talk to a rotating crop of new moms on a regular basis. I actually spend a lot of time thinking about how to help them out. This week I sat down next to a mom and her five day old and she was struggling at home by herself all day and wondering if she should invest in all the fancy baby gear. So today, I’m paraphrasing my advice to her and all the other new moms who’ve asked me similar questions. You are sore, tired, and swimming through hormone soup. 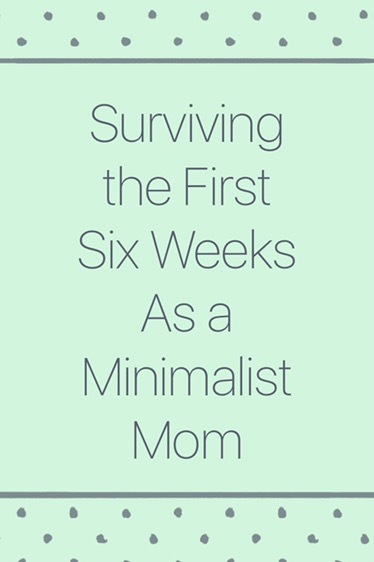 The first six weeks aren’t about showing off what a perfect mommy you are. You’ve just started! Expect to learn and experiment, especially in those first six weeks. It’s hard to do that in front of an audience, especially one you feel judged by. No one was invited to visit us for the first two weeks after Kai was born. Your baby needs to bond with you, so it’s completely okay and not selfish at all to have grandparents, friends and neighbors wait to meet your baby. Your baby is a little person, converse with them, treat them with respect and acknowledge that this may indeed be the hardest thing you’ve ever done. Imagine that you’ve been magically transported from the warmest, fluffiest down covered bed–we’re talking full on hygge here–into a land of giants. Even though you might not immediately see the cues that let you know your baby is listening and understanding what you are saying, telling them what you are about to do goes a long way to creating a strong bond of trust and cooperation. I mean, wouldn’t you rather the giant warn you that you about to be lifted into the air? We also didn’t leave the house much those first two weeks. We’d stocked up on freezer meals and essentials and created our own little family cocoon. We quickly learned to sleep in shifts. Babies are born nocturnal and switching their sleep patterns takes a while. If your significant other feels like they need to be awake every time you are awake and vis versa no one sleeps at all, and everyone will be crying and exhausted at 3 am. Ask me how I know. Set up stations and replenish them in the morning, so you are prepared for the day and don’t have to fetch things if you don’t want to. Mom station: I lived in our Lazy Boy for the first six weeks. Most important is the biggest water bottle you own, or a water cooler if you have one, so you can refill your bottle with cold water without getting up. I feel like I drank a swimming pool’s worth of water each day for the first three or four months. Protein packed snacks are also a must. You will be hungry, and you need to eat to keep your supply up. Diaper station: Newborns need their diapers changed every two hours at a minimum. Having all your supplies handy and ready to go is so helpful. We started the morning with twelve diapers, a large wet bag for dirties, a handful of Gerber Prefolds for burp cloths, two extra outfits, and two swaddle blankets in a basket. We also moved a laundry basket downstairs for all the baby laundry so it didn’t end up all over the place. Bathroom station: I know I said minimalist, and for the most part we stayed away from babygear, but having a safe spot for the baby to be while you are in the bathroom is essential. Whether you put down a blanket on the bathroom floor or permanently station a bouncing seat there, you can’t deal with toileting essentials and hold the baby. Stick all your essentials in a box, especially if they’ll need to be transported up and downstairs. Cloth postpartum pads were a miracle compared to the disposable ones that seem to be able to attack stitches no matter what you do. I did use the disposable ice packs that the hospital sent me home with, though you could just use ice. I also used the peri bottle they provided. All in all, spend time enjoying your baby. You don’t need a bunch of stuff to do that, just a place to sit and cuddle and enough food, water, and diapers to keep everyone happy.